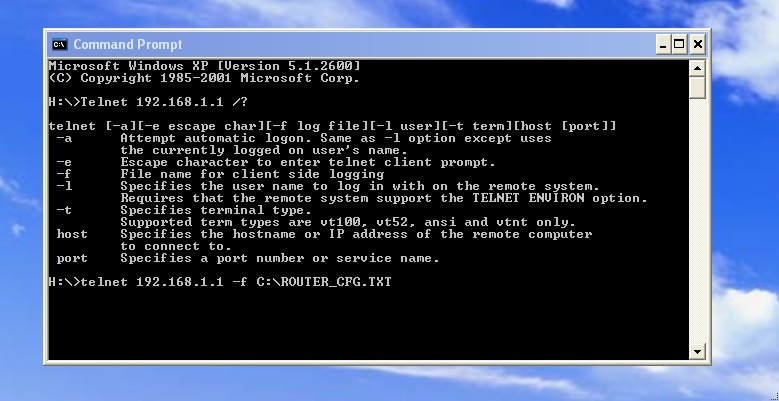 Open a Command Window from within Windows and “tail” the session by using the argument -f with the telnet command. This is a easy way to grab a Show Run, Show Version, and Capture Debugging messages from within the telnet session. This is much easier than trying to copy and paste the output into Notepad from within the command window. The scrollback within command.exe is not usually long enough for large Cisco router,firewall, or switch configurations. 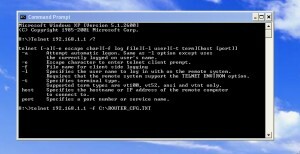 This way you can simply open a command window, telnet to your device and get your Show commands and exit knowing that all the output will be stored in the text file you specified. That was indeed much helpful ! I did knew that I could capture the telnet output to file but I was not sure what the command format was . Yeah , it is much easier than copy pasting the whole thing to notepad . Thanks for sharing ! I needed to transfer a text file (some source code) and this worked perfectly. I just used “cat” to send the file to stdout and I was done. How can use use -f command and save with unique file name such as dd-mm-yy_cfg.txt? If you are wanting to have it automatically save the date/time in the filename, I am not sure how to do that without scripting it somehow. Otherwise, you can replace the “dd-mm-yy_cfg”.txt with anything you want it to be, though you will have to type it in manually. Hope that clarifies things, thanks. If this is not possible, maybe I should look into having script renaming it after it completes it’s operation. very nice…simple and effective, thanks. thanks for this gem – just saved me tons of time . I have tried this utility but this not logging the session into file. Destination File is blank. Any guess. What a great tip! Works as advertised and easier than struggling w/ the MARK whatever procedure.